Each year, at IES Abroad London, I teach a history of London course. My students are first-year undergraduates from Skidmore College, a liberal arts college in Saratoga Springs, New York State. The course is designed so that students learn to appreciate the social, political, economic and environmental influences that have shaped the development of London over two millennia. More than that, a key goal of these courses is to help first-year undergraduates develop the essential skills that they will need for a successful career – both at university and thereafter. This year, in addition to the usual examination and essay requirements of the course, I asked all of my students to write something for the Institute of Historical Research’s Layers of London project. Why did I do this? First, I wanted them to realise that there are many ways to produce historical research beyond writing essays. That is not to say that being able to express oneself clearly in an essay format is not important – far from it. But it is to say that graduates today enter a competitive job market and learning how to condense one’s research into a concise 300-word piece for a website is a useful transferable skill for any student to develop. For me, their Layers of London pieces did not replace the longer assignments, rather they complemented each other. Moreover, the Layers of London project is one that will grow and it will be used by historians and researchers interested in the history of London. I thought that for American students spending a term in London on a study abroad programme, producing something for this website was a nice way for them to leave their own personal mark on London’s history. It was easy enough to set up a team which all the students were able to join by clicking on a personalised link. Prior to choosing a topic which interested them, I took the opportunity to speak to each of my students individually. In all of these sessions I thought it was important not to be too prescriptive: I wanted the students to choose something which engaged them, whether that was a building they walked past every day, a person whose life they found interesting, something connected with a hobby or interest of theirs, or perhaps even a person or place from London’s history with whom or which they could identify. I could not have been happier with their efforts. The students seemed very much to enjoy the freedom of being able to choose a topic of particular interest to them, and they approached the task with some gusto. Many of the students travelled considerable distances across London to take photographs for their website entries, and I was particularly impressed by the original research which they conducted, be that reading nineteenth-century Old Bailey Court Records or knocking on the doors of various institutions across London to find out more about their histories from the people within. What was most pleasing for me as their teacher, however, was the amount which I learned from their efforts. Now when I walk along Primrose Street on the borders of the City of London and Spitalfields, I know that it was the street on which Mary Wollstonecraft was born on 27 April 1759. Now when I swim at Dulwich Baths, I know that in both World Wars the Baths functioned as much more than just a place where people could swim and exercise. Now, too, I know that St Peter’s Italian Church in Holborn was the church which first catered for the Italian immigrants who settled in the Holborn and Clerkenwell areas in the nineteenth century. As someone who teaches and writes on the history of London, it was a rewarding experience. I look forward to learning more next year. Octavia Hill Cottages, Southwark. 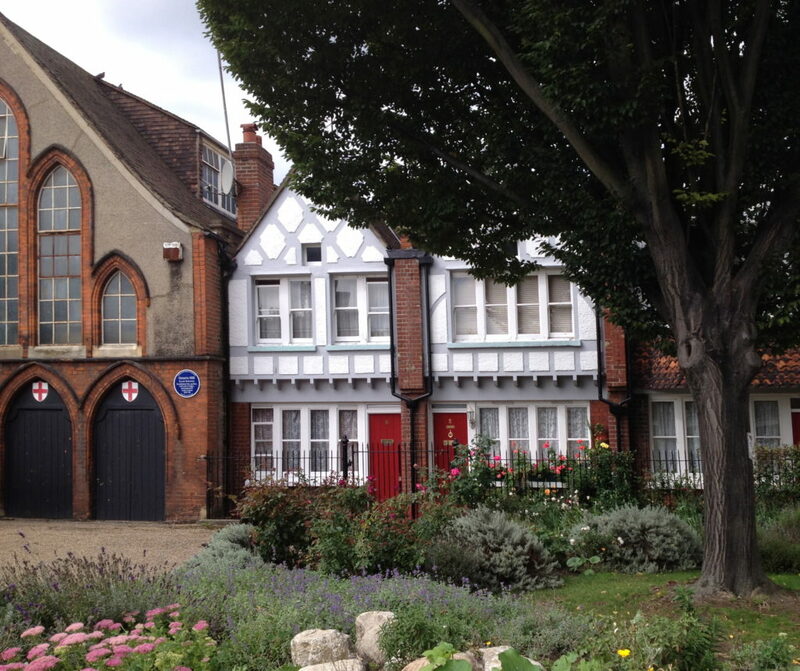 Constructed between 1884 and 1887 these cottages were designed to provide comfortable accommodation for the working poor and provide the spaces for community interaction. They were constructed on land given by the social reformer Olivia Hill to the Ecclesiastical Commission, reflecting Hill's belief that one should "Do noble deeds not dream them." (Excerpt from a contribution to the Layers of London website by a student at IES Abroad. For the complete entry see: http://alpha.layersoflondon.org/the-map#/pins/827).